"Making CILT's voice heard in Scotland" by Richard Atkinson, CILT Director of Marketing and Communications: Edinburgh meeting of 24 October 2017. 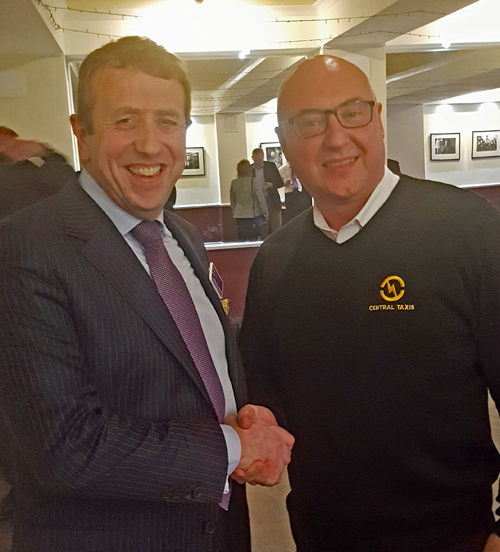 Richard Atkinson (left) with Scottish Region Chairman, Tony Kenmuir (right). We need to hold the attention of young people if we are to persuade them that membership of CILT should be their preferred choice. Our members are strongly together, but a single descriptor of us is difficult to capture - the UK leads Europe in for example online retailing, but your great contribution is not understood. CILT could not buy the coverage that we are getting on Brexit, which could leave a skills gap given the reliance of our distribution companies on overseas nationals. The Institute must mimic the pace of change in society, particularly the revolution in communications since the first email was sent in 1971 and telling young people that we are key to them getting exciting jobs. We are stronger together, but our message to our audiences must recognise the diminishing attention span brought about by so much communication. In reaching young people we must inspire and respect them and must also evoke their response, hence the Institute's merger of its social media into a single arm. The Institute has enjoyed a stable membership which has however been largely passive. In order to grow, we must enlist a more active interest, and can do so by encouraging hands-on involvement, providing authority figures and appealing to the power of liking while always being consistent in our messaging and seeking reciprocity. Our messages must be meaningful and memorable, offering soundbites that are short, rhyming, rhythmic, passionate and purposeful so as to hook our audience's attention. In seeking to be the key membership organisation for transport and logistics professionals we should offer pride in our professionalism, providing knowledge, networks and knowhow that help place the right people in the right places with the right knowledge at the right time. We must show you the members what is our part in your plan, whether by offering the largest hard-copy specialist library in Europe or unrivalled access to databases. With five national and over three hundred regional meetings annually, we bring our members together, enhancing their abilities through our courses, and by drawing on their expertise can present to government at all levels advice that is in the best interests of the nation. We are not yet essential to our members, and owe them better for our mutual success.